1. Preheat the oven to 190°C, gas mark 5. Leaving 3cm of stalk still attached to each beetroot, remove the leaves. Place the beetroot in a large roasting tin, spray lightly with oil and roast for 50-60 minutes, until tender. 2. Leave to cool, then peel away and discard the skin and stalks. 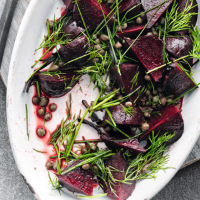 Cut the beetroot into wedges and toss with the herbs, red wine vinegar and capers. Spritz with olive oil and serve.